If you and your pet have been active all year, there should be no reason to become sloth-like during the winter. 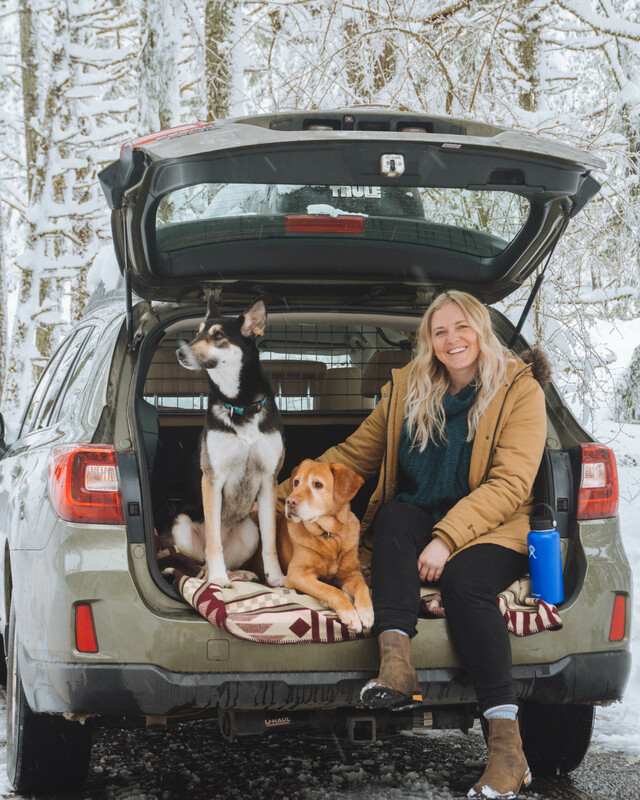 Admittedly, it can be tempting to hunker down inside when temperatures plummet, but getting active and staying active with your dog will actually change your life. No exaggeration. 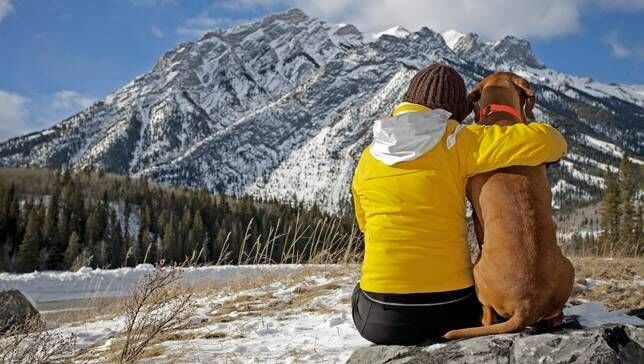 With a bit of creativity and planning, it’s possible to enjoy every season with your pet and get more benefits than you might realize at the same time. Here are a few activity suggestions that could help keep you both healthier during the colder months. Skijoring is a unique combination of cross-country skiing combined with dog power. This sport began hundreds of years ago in Norway and was called skikjøring (or ski driving). Horses and reindeer were used in Norway, but when the concept spread to Alaska, dogs were used instead. The dog wears a skijoring harness and is attached to the skier with a belt and a towline. This sport only works well with larger dogs, but you don’t need to own a Husky. Golden Retrievers, Dalmatians, or Border Collies, for example, can all enjoy the sport. If your dog weighs at least 35 lbs, is healthy, and has a lot of energy and stamina, it could be a good option. Both owner and dog get a fantastic workout (with owners able to burn between 700 and 900 calories per hour) and take advantage of the snowy conditions at the same time. If this sounds like the sport for you, it is advisable to get a health check for you and your dog. If you’re both good to go, start out slowly, building up the length of sessions as you get more familiar with the activity. Look online for Skijor clubs in your local area, which could offer some group sessions and may give you tips specific to your location. SkijorUSA might be a good place to start. Some states that typically get winter snow have designated trail areas, so check out what might be available in your state. This is becoming increasingly popular in the snowier regions of the country as you can burn between 420 – 1,000 calories in an hour depending on speed. 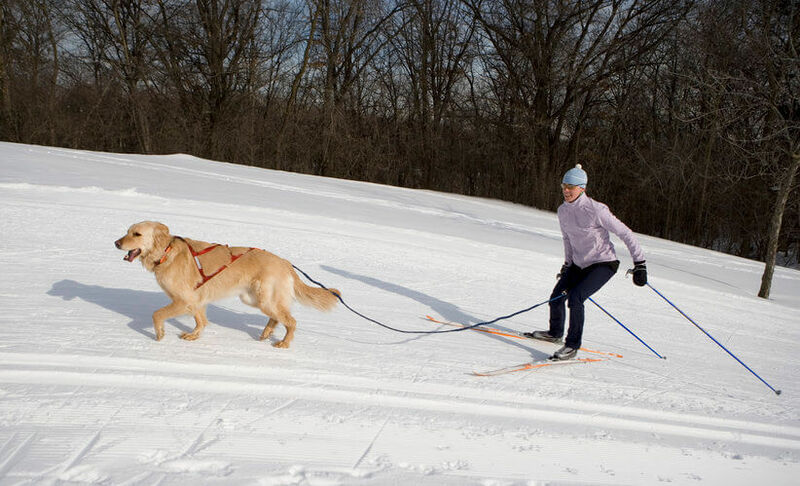 Some dog owners like to carry poles, so prefer to snowshoe with their dog on a waist leash. This activity offers cardio training, strength building, agility, and balance – a serious workout for owner and dog. When we think of mushing, we often think of a sled pulled by multiple dogs, but actually, the term refers to any form of transport that is powered by dogs. Traditional mushing with a sled in the snow is extremely popular in Alaska but is also growing in popularity in the lower 48. Dog mushing has become a popular activity for those wanting to explore the backcountry. There is quite a bit of equipment and training required for this version. If you find the thought of traditional mushing a bit daunting, there are other options, although most of these are better suited to conditions without ice or snow. There is a wide range of products on the market, so why not check out the different options and see if there is something that appeals to you. 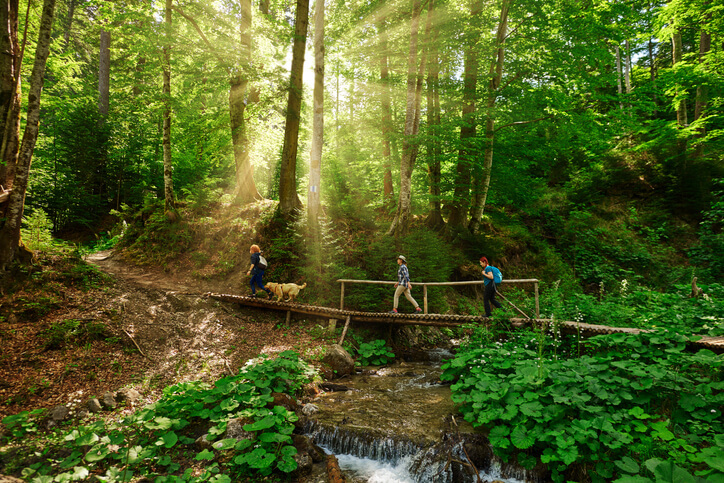 Hiking is a very popular activity and shouldn’t be reserved for the warmer months. When there is snow on the ground, it certainly adds to the intensity of a hike. This activity can be achieved without needing to purchase or rent additional equipment, but do take plenty of water, snacks and a first aid kit with you. Ensure that both you and your dog are adequately protected against the elements with appropriate clothing and footwear. With any outdoor activity during the winter, make sure your pet’s paws are washed clean of salt after being outside. If you are likely to be going out into harsh weather conditions regularly, you may want to consider investing in hiking boots for your dog, to protect paws from injury. Not all dogs will wear them so paw wax may be a good alternative to protect the paws from ice and snow. Not everyone wants to or is able to participate in intense forms of exercise with their pet, but in addition to regular walking, there are other more moderate activities that you can introduce during the winter months. Practicing nose work is a fun search activity for your dog, based on the scent training that police and rescue dogs undergo. This activity provides great physical exercise but is fantastic for mental stimulation too. Dogs learn to search for a specific odor and find the source of that odor. The nice thing is that it can be done almost anywhere. The wind, rain, and snow can affect scent flow, so practicing in the winter can be a different experience from other seasons. If you would like to develop your skills, K9 Nose Work can help you find an instructor in your area. If the weather is just too severe to venture outside, you can set up an agility course in your own living room. It is possible to purchase objects like tunnels, hoops, and hurdles for your pet, but if your budget doesn’t stretch to those, simply look around your home and everyday objects can achieve a similar result. Set up obstacles with items like brooms or rolled up blankets and encourage your pet to jump over these obstacles. You may have to jump too initially but aim to progress to verbal cues. Put items like newspaper or aluminum foil on the ground, so your dog gets used to different textures and sounds under his paws. Add a collapsed tunnel adventure by using a chair draped in a blanket – sit one side and encourage your pet to go through. Designed for year-round use, but particularly helpful in extremes of weather, indoor dog parks are a great option. Many indoor dog parks have opened throughout the United States, so check online to find one in your area. At some, you can sign up for an agility class, a swimming lesson, or even have a go at doga (yep, yoga with your dog!). How can these activities change your life? Any activity or exercise during the winter (whether inside or out) is great for improving cardiovascular health and overall muscle tone for you and your dog. Exercise has been proven to be helpful in improving mental health, as endorphins released during exercise reduce depression and anxiety. Being exposed to as much natural sunlight as possible helps in overcoming SAD (Seasonal Affective Disorder) that can affect many people during the winter months. 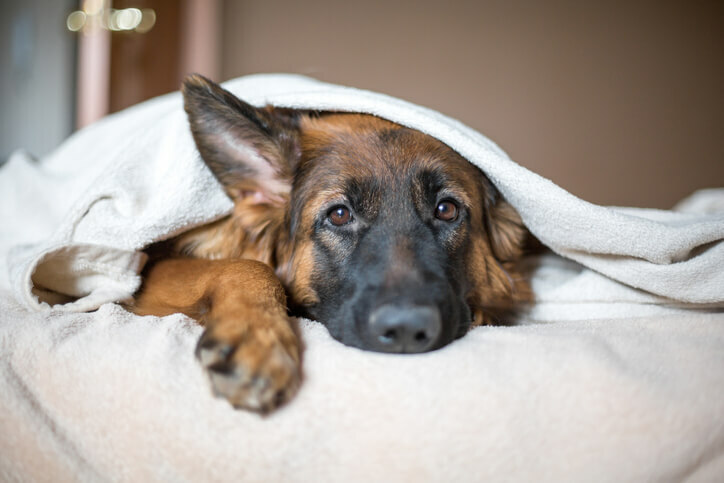 Although you are never truly lonely with a dog in your life, engaging in activities that promote greater social interaction (such as going to an indoor dog park or signing up for a class) can be so helpful for anyone struggling with isolation and loneliness at this time of year – again improving mental health. Embarking on any activity allows you to develop stronger, closer bonds with your pet, which is good for the soul in general. With countless benefits, whatever you do this winter, pick an activity that you and your pet can enjoy and will do regularly. Get active and maximize your time with your best friend! What do you and your pet love to do at this time of year? We’d love to hear about it!